A hilarious mash-up of cats and Austen. What if Jane Austen’s Pride and Prejudice was told from a cat’s point of view? On the heels of smash hits like Pride and Prejudice and Zombies and I Can Has Cheezburger, this hilarious mash-up by children’s author Pamela Jane and photographer Deborah Guyol spins a fresh, quirky take on two of the things we just can’t get enough of: classic cats and classic Jane. Pride and Prejudice and Kitties juxtaposes wacky photos of cats with the wicked humor of Jane Austen. Soulful Mr. Darcy gazes at Elizabeth Bennet in fascination; hysterical Mrs. Bennet yowls that no one understands her; somnolent Mr. Hurst passes out on the sofa after dinner; arrogant Lady Catherine hisses at Elizabeth. Each photo includes a hilarious caption that goes along with the text of Pride and Prejudice, told from a feline perspective. 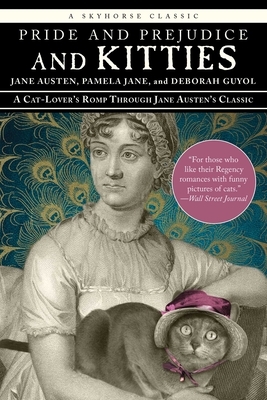 Pride and Prejudice and Kitties is a book for cat-lovers, Austen-lovers, and people who love to laughin other words, just about everyone. Jane Austen (1775 1817) was an English novelist whose works of romantic fiction, set among the gentry, earned her a place as one of the most widely read writers in English literature. Austen lived in Hampshire, England. Pamela Jane coaches writers, conducts writing workshops nationally and internationally, and has written twenty-seven children s books including Little Goblins Ten and Noelle of the Nutcracker. Pamela also contributes to the popular blog, womensmemoirs.com. She resides in Philadelphia, PA.
Deborah Guyol has studied photography with Larry Sultan, Judy Dater, and Ellen Brooks, and her photographs have appeared in print and web publications. She is also a lawyer and the co-author of, and she edits a legal publication, teaches creative writing, and run writing workshops. She lives in Portland, OR. "A unique, cleverly written, and utterly hysterical re-telling of Pride and Prejudice...Miss Austen would approve! "Sharon Lathan, best-selling author of Mr. and Mrs. Fitzwilliam Darcy: Two Shall Become One. ALA Booklist Online featured the book and book trailer: "We give you Jane Austen and cats, and that means we're in it for the long haul."